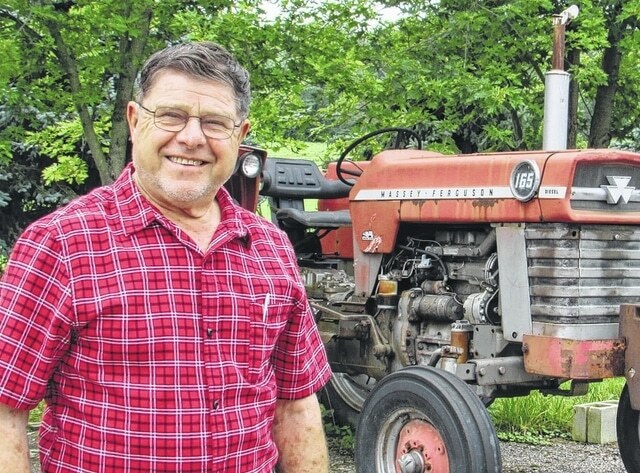 Cornelius “Corny” Friesen, a former Massey-Harris Ferguson tractor dealer, has been a longtime fan of Massey-Harris Ferguson tractors. It is the featured make at the 66th annual Steam Threshers Association. He is seen here with a model 1020 compact tractor. 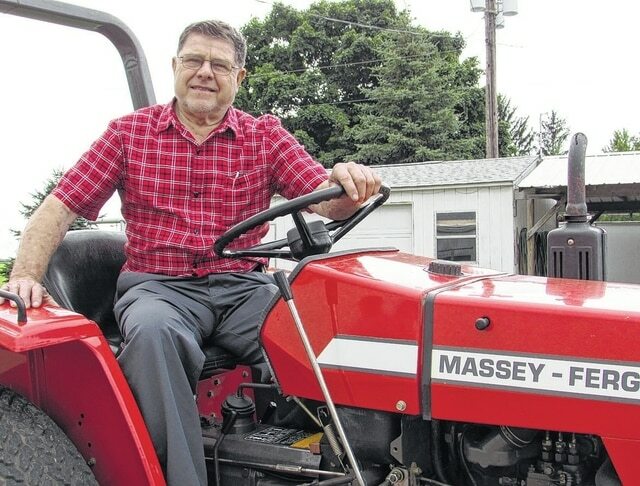 Cornelius “Corny” Friesen, a former Massey-Harris Ferguson tractor dealer, has been a longtime fan of Massey-Harris Ferguson tractors. It is the featured make at the 66th annual Steam Threshers Association. He is seen here with a model 165. PLAIN CITY – Cornelius Reimer Friesen is unique among North Americans. He was born in Canada in 1943. At age five, he went with his family, to reside in Mexico. By the time he was 23, he moved to that nation in between the two. Friesen, now 72, became a citizen of that nation between the two — the United States, in case you hadn’t guessed — in 1984. Now, he is the grand marshal of the parade for the 66th annual reunion of the Miami Valley Steam Threshers Association, which will be held July 16-19 at Pastime Park in Plain City. Friesen also sold and serviced Massey-Harris Ferguson tractors, the featured make at the steam threshers reunion. While growing up in Mexico, Friesen learned from his father how to maintain and repair mechanical components. The family subsequently moved to the Central American nation of Belize. The Friesens and other families cleared the land, built homes and started businesses. Friesen manned a bulldozer and cut roads into the new community. There he met Lester Gingerich of Plain City. Friesen took a break from his work and visited him at his home. There he met Lester’s sister, Ida. Ida subsequently visited Belize to help a relative with postpartum care of mother and child. There she and Friesen began to date. They were married in the fall of 1966 and had six children. They settled in Plain City where Friesen began his fabrication business, Friesen Fab & Equipment Co., in his home’s garage. It grew and expanded into the small business it remains today. Friesen’s son, Daryl, is taking over the day-to-day operation, but dad still enjoys getting his hands dirty building or restoring one of a number of Massey-Ferguson tractors. Friesen owned an Massey-Ferguson dealership from 1985-2005 and he said it was a good partnership. Friesen said the steam thresher show committee told him as grand marshal, he may ride through the parade on the vehicle of his choice. He would like to ride in the back of a convertible with his wife, Ida, to wave to the crowd. If anyone with a convertible would volunteer to chauffeur them for the parade, Friesen may be contacted at his business: 614-873-4354.